In its efforts to attract suitable investments to Sri Lanka and revive the country’s export positioning in international markets, the Government has recently made a series of broad changes. 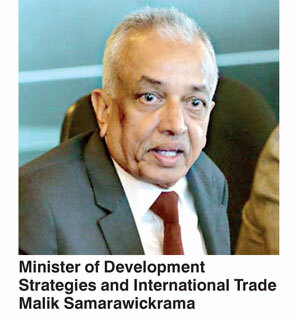 According to Minister of Development Strategies and International Trade Malik Samarawickrama these changes will assure the development of the country and address unemployment issues. “We have established a new global recognition in Sri Lanka. This required a decisive shift in the policies by moving away from protectionism and the unfavorable regulations prevailing in the country for a long time. An unfavourable domestic business climate and ineffective regulations discouraged foreign investors and traders from effectively contributing to the growth of the country. All over the country there was a significant level of unemployment. 60% of the labour force was made up of informal sector workers. Providing them better jobs with higher salaries are obligations our Government must fulfil,” he said.